A carefully chosen print really packs a punch in a room. It can deliver some much needed colour or can make other colours in existing décor really pop. I think a perfect print for a child’s space is something they can love that evokes a smile at every glance. Watotodesign is a collection of fantastically fun art prints that fit effortlessly into any children’s décor. 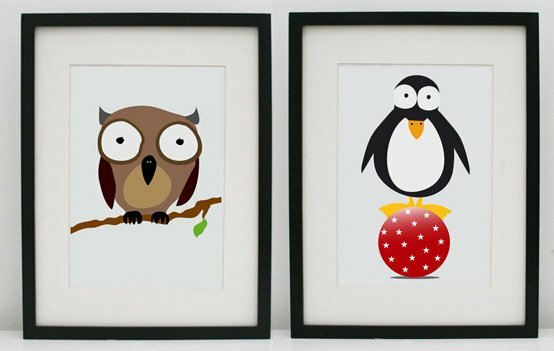 These wide eyed characters look slightly quirky and ooze mischievous fun, guaranteeing a giggle from small admirers. I’m quite smitten by the Circus Penguin and the Penguin Pyramid. After all, who can resist a stack of magnificent marine life? Watotodesign also offer alphabet prints enabling you to have an adorable menagerie of twenty-six animals in one print. If you’re after something truly special or need a great gift, order a personalised name print in a choice of four colours. To see the full range, head on over to Watotodesign. Print prices start from US$27 with delivery to Australia available.